A cold night over night with rain and ice pellets and a wee bit of snow as well. When we woke up it was trying to snow and tiny white flakes were coming down but nothing was sticking. The temperature read 28F/-2 C and believe me it was definitely pretty accurate. We were up at 7 am CDT and on the road by 8 am CDT. I was a bit concerned about the roads to the interstate as it was down a pretty steep incline and I noticed where others had been sliding and slipping but I kept everything slow and easy and the one time I touched the brakes it was just wet pavement. We were good to go. Within minutes we were on I-65N with just some wetness coming off the roadway. I have no idea where we cross the time line but by 9:19 am CDT I mentioned to Riley to check the phones and sure enough we had crossed the line somewhere and we were once again back in our own time zone, EASTERN DAYLIGHT TIME. Yeah us. Not much snow on the sides of the road either. See Ohio is beautifying their ramps as well. Great roads, dry, and sunny, what else could you ask for? We had absolutely no issues at all and things ran along just fantastic. We iced up pretty good and at one point had a pretty thick coating of ice on the front of everything and sprayed along down the sides of the Dogsled but at no time was the roads ever slippery or even snow covered. All just stop splashing up and freezing on. We were those people that you see at the rest area with ice hanging everywhere and you say to yourself," Glad we didn't go through that." Honestly though, we didn't hit any weather at all. We eventually reached a high today of 37F/2.7C and that was all we could wring out of the sunshine. On I-71N between Louisville, KY and Cincinnati, OH the sun came out and the road was dry. We enjoyed a wiper free drive the rest of the way. This is mostly OH 235 North. 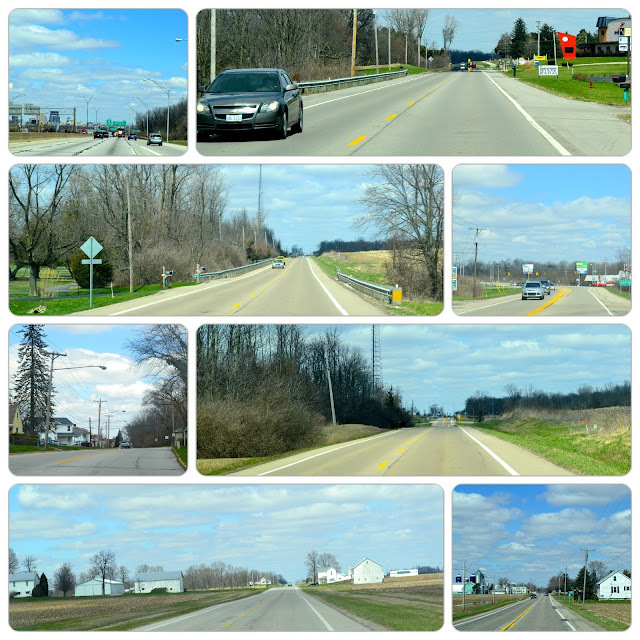 A very nice road, with a few small towns, a few lights and few slow downs but nice, quiet, not too busy at all. Great road if you aren't in a hurry. As we reached Covington, KY (just across the river from Cincinnati, OH) the traffic slowed down, seeming to back up for a while, but we managed to keep rolling, it cleared up for 5 minutes but once again slowed down and crept along. This was the norm until we were actually out of Cincinnati. I was surprised, there was no reason for any slow downs at all, no construction, lane changes, accidents, etc. Just some mystical reason I guess. 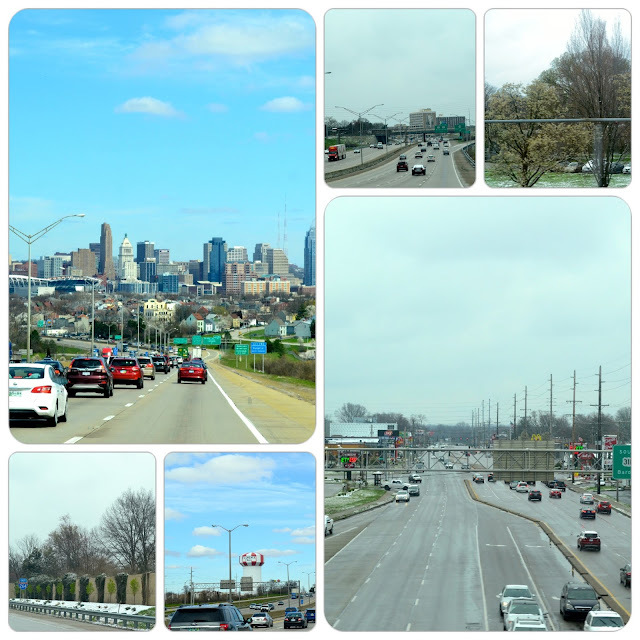 I will say the construction in Cincinnati has been on going for as long as I can remember but I will tell you that they have vastly improved the over all interstate, both surface conditions and width of lanes, not to mention taking out some of the very sharp turns. A bit more work is needed in a few places but over all, the best experience I've ever had moving through Cincinnati. Congrats to the city for doing such a wonderful job. 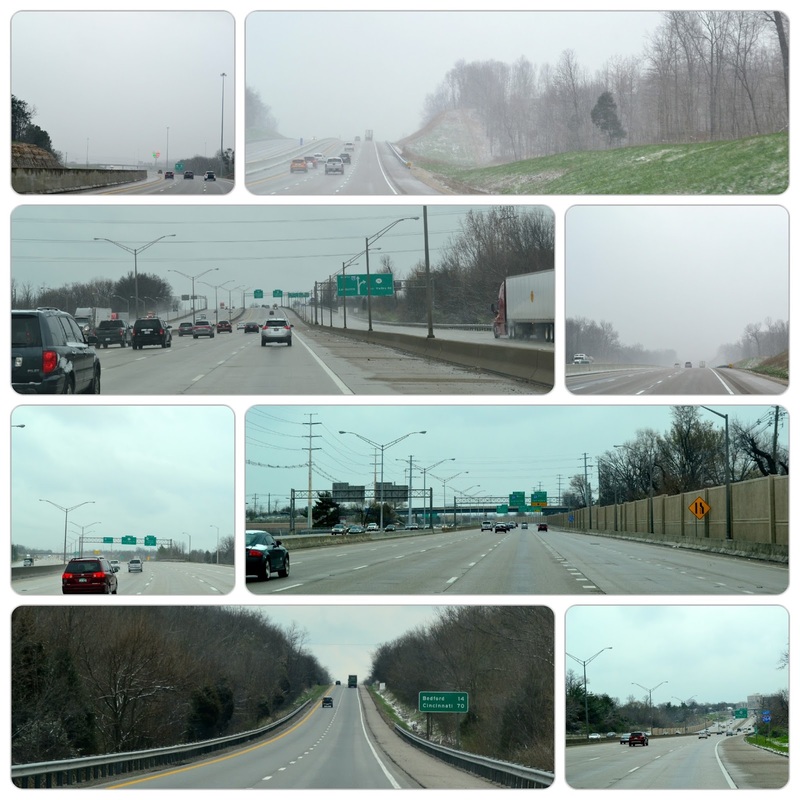 The big pic on the top left is coming down the hill in Covington, KY toward Cincinnati straight ahead. The others are Louisville, KY, Florence, KY, and Dayton, Ohio. 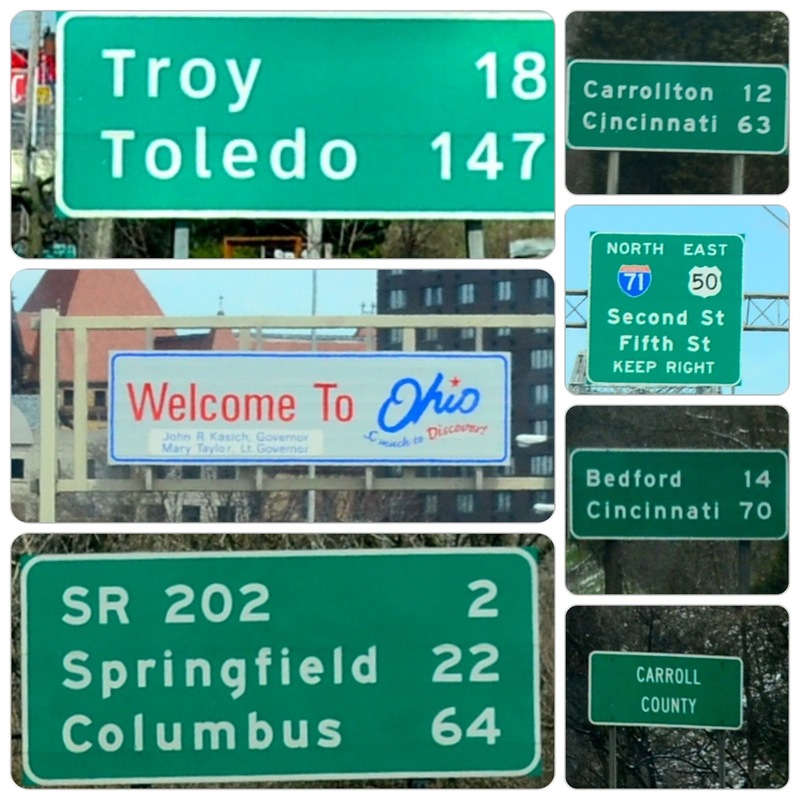 Instead of following the GPS and taking 4N out of Dayton we stayed on I-75N until we came to I-70 East toward Columbus. We followed that for a bit and then took the exit for OH 235N. From there it was straight sailing and we managed to pull into the campground just before 3 pm EDT. I've never seen a Field & Stream store before but I'm sure they're around. I believe these pictures are Cincinnati, Dayton, and New Carlisle, all in Ohio. The campground is nice with pretty decent sized spaces, and we are parked literally on the Miami River. We can see it out the door. However I will say that I doubt we'll be back due to the state of the office. It is a small, cramped space, that is seems very junky and reeks of cigarette smoke. In fact they smoke as evident by the half full ashtrays that litter the desk area. The folks are friendly enough, helpful, and accommodating but the smell of the office is too much for us. A nice black lab greeted us at the door and continued to stand and lay at my feet making it difficult to move. A nice fellow named Roger brought us to our spot which is high and dry on a gravel driveway which suits us fine. We have electric and water is available but I won't hook up until after the chance for freeze is over. They have a dump station as well. We are back off the roadway by a long distance and I think we'll enjoy the time here as we're close to a few little towns and villages. So hopefully we find some interesting things to keep us amused for a bit. 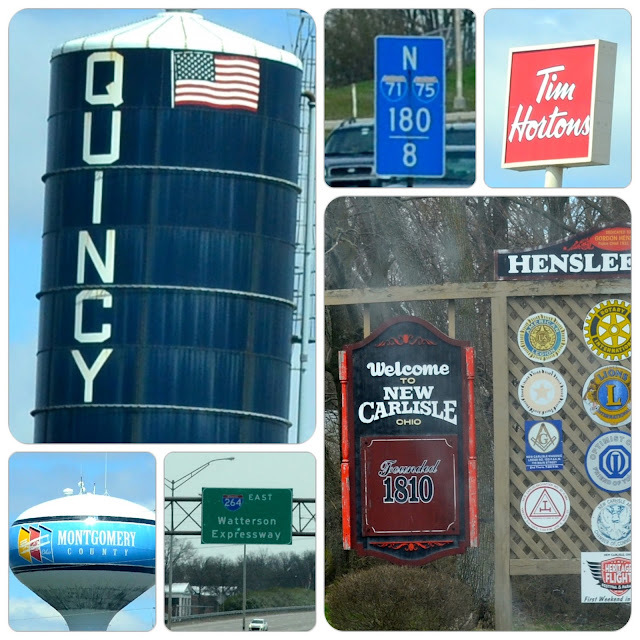 A few water towers, road signs and of course the welcome sight of TIMS!!!! The overall drive was fantastic, a bit sloppy this morning but nothing that required constant wipers, only occasional. The temperatures aren't too bad either, all things considered. They told us they had 6" of snow when I called earlier in the week, and since then they've had a flood and more snow but today there is nothing but bare ground and a very high river. 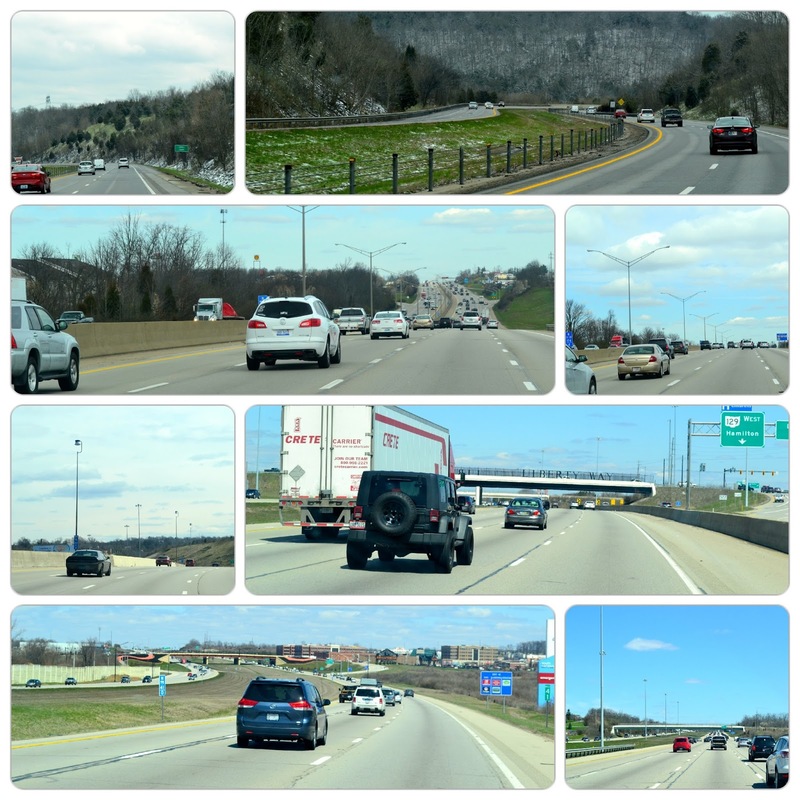 Kentucky needs to work on I-75 North as it's pretty rough in a few spots but still a decent drive. Ohio also needs to work on a few rough spots but again, nothing too serious. We traveled about 280 miles/ 450 km today, it took us approx 6 hours with 2 stops along the way. We used around 25- 27 gallons of diesel through all those hills, so I'm pretty happy about that. I noticed $2.76 for diesel a bit back down the road so I'm hoping the prices in the area are all about the same, a fill up will run us into the $70 -75 US dollar mark. We will be here until Saturday when we will pack up and head for Ontario. I'm not sure but I think this is the Miami River in Dayton, OH. So there you have it, thanks for stopping by, hope you enjoyed the trip. Feel free to drop a comment. Hello Greg, welcome to A long and lonesome highway. It is funny how we do that. We change the clocks as we don't have wrist watches so we depend on the few clocks we have. I will say though that I have multiple clocks set on my computer so I can keep track when we travel. It was odd calling my dad and not having to stop to think about what time it was at his house. Thanks for stopping by and also for leaving a comment. What a great post. I know what you mean about offices and the smoke and mess. One we were in Arizona reeked of smoke too, it was Passport America but she just took our $, no info, so we were out in less than a minute, that I can handle haha..Never heard of a Field and Stream either..bet it would be interesting. Enjoy your time there. Thanks Shirley. It is the only thing that would stop me from coming back or recommending the park so far at least. I realize smokers have rights as well but if it reflects on your business I think that would mean something. Although I think most folks here are seasonal by the quick look around. The worst driving weather is always just above or below the freezing mark. You just never know if there will be ice. Good to hear you got through it all ok. I saw in your last post the diesel and gas pump handles. That would be a bad day if they got mixed up for sure. You are right about the pumps getting mixed up. Not a good thing. I'm always pretty careful but I can see how it would be easy to do. We didn't have any bad weather it just looked bad but the first few minutes I was worried about the big decline from the campground to the interstate but I think enough folks had been on it to make it fine. It would be just a fine, fine skim but enough to give you a thrill for sure. 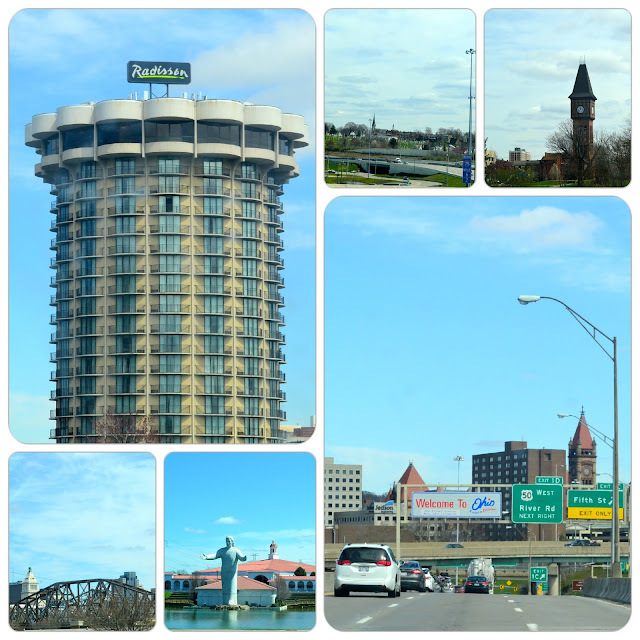 The interstate was just wet with no issues of any kind and then only to Louisville, about 80 miles, I-71 was dry. With so much truck traffic on the roadways these days they pretty much pound any ice off quickly. What great pictures of your travels today. Glad the weather co-operated and gave you good roads to travel down. 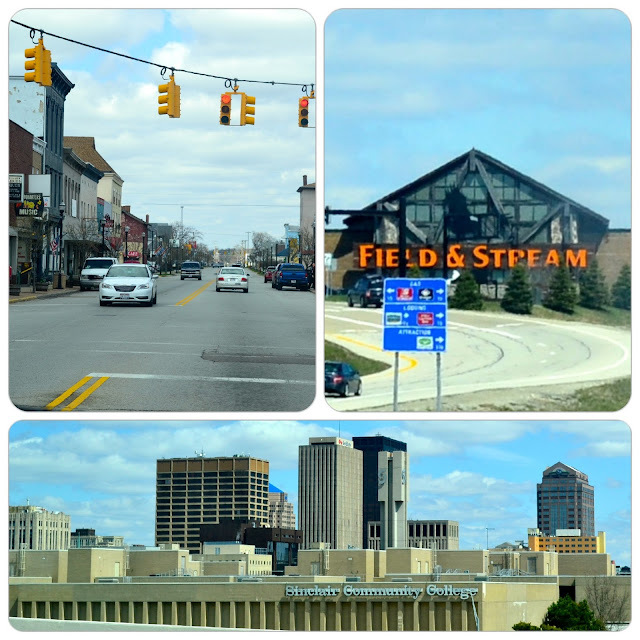 Enjoy your time in Quincy. Thanks Deb. I can never figure out which travel pictures to post so the collage kind of gives a good summary for future reference as well as entertainment value. What a nice travel day you had making good time and settled in for a while, looks like you are about 30 miles south of us real and hope the weather warms up for you soon. Thanks George. Yeah, I thought we'd be close by but wasn't sure exactly where you were. You can't be much warmer than we are but I think only one more day and things start getting better and better.